Location: The hill of Hissarlik, Plain of Troad, Turkey. Grid Reference: 39° 55’ N. 26° 14’ E.
First excavated by Dr. Heinrich Schliemann, in 1870, the city of Troy was discovered after a lifelong quest which led Dr. Schliemann to the plain of Troad, on the north-west coast of Turkey. Until its discovery, it was considered a fictional city from the 'Illiad', by Homer. The discovery is one of several 'mythological' places that have been unearthed over the last two hundred years. Location of the famed 'Priam Treasures'. Description - Ilus, the son of Tros founded Troy in 3000 BC, and the name Troy was derived from him. Immortalised by the writings of Virgil and Homer, the ruins of Troy were first found by Charles McLaren in 1822 (2), and excavated by Dr. Heinrich Schliemann, in 1870. The city of Troy was re-discovered after a lifelong quest which led Dr. Schliemann to the plain of Troad, on the north-west coast of Turkey. Until its discovery, it was considered a fictional city in the 'Illiad', by Homer. The discovery is one of several 'mythological' places that have unearthed in the last two hundred years. Dr. Schliemann discovered four settlements or cities beneath Illium, one below the other at Hissarlik, of which he determined the third deepest to have been Troy proper, where he found the so called 'Priam treasures'. 'These four cities were separated from each other by layers of ash and other marks of conflagration' (1). The German archaeologist Heinrich Schliemann excavated Troy from 1870 to 1890. 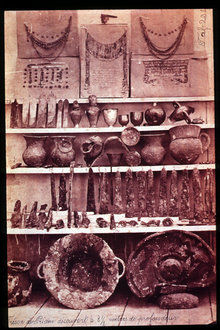 His theft of treasure from Troy and his damage to the site will be always remembered in Turkish archaeological history. Wilhelm Dorpfeld followed to excavate Troy after Schliemann. Today, a new German team is still working to rebuild Troy ruins by using new advanced technologies since 1988. Chronology - There are nine levels at Troy; Troy I to V relates roughly with early Bronze Age (3000 to 1900 BC). Its inhabitants were known as Trojans in this period. 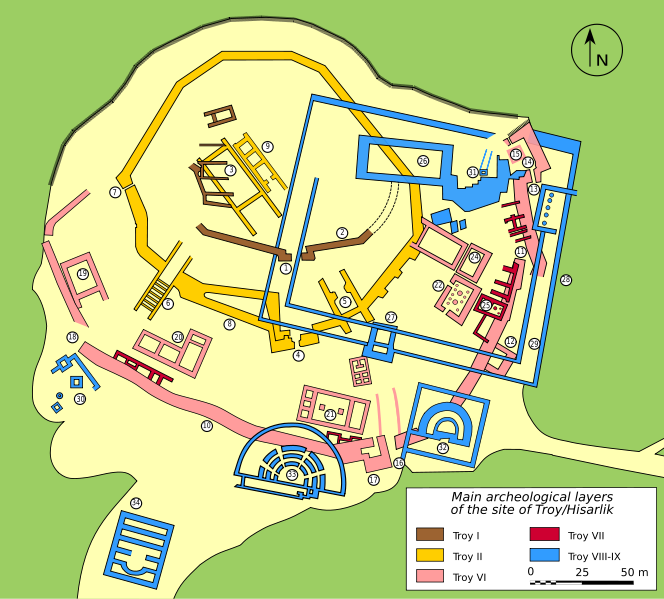 Troy VI and VII were built in the Middle and Late Bronze Age. Troy VIII to IX belongs to Hellenistic and Roman Ilion (Latin Ilium). 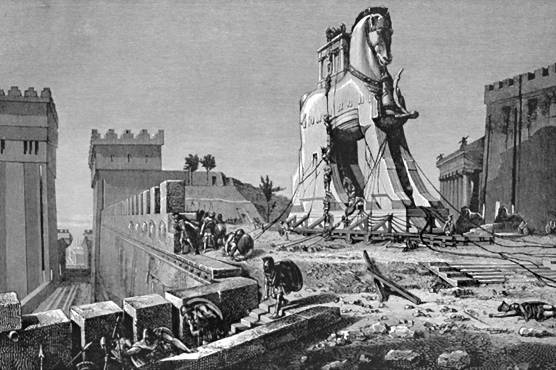 Troy was destroyed many times and rebuilt each time. Troy V: 20th-18th centuries BC (Western Anatolian EB 3 [late]). 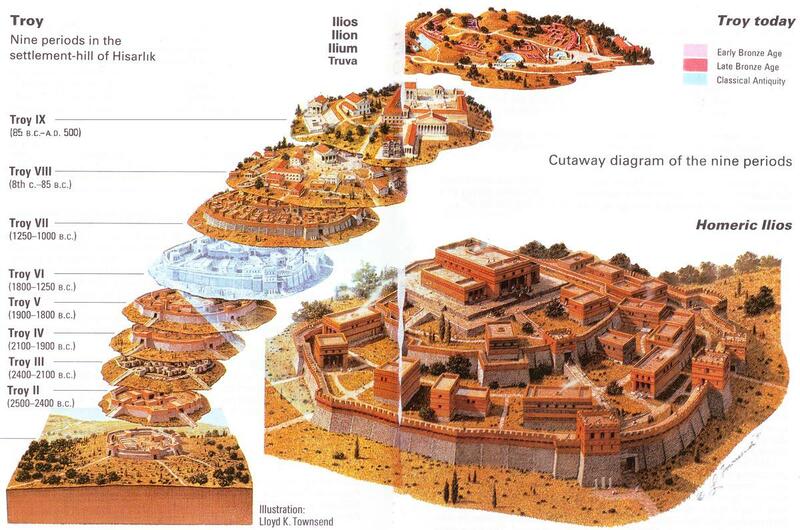 Troy VI: 17th–15th centuries BC. Troy VIIa: ca. 1300–1190 BC, most likely candidate for Homeric Troy. '...sadly all but one pair of earrings and a few other small objects disappeared from Berlin in 1945...' (1). A Turkish team is currently trying to retrieve the Trojan treasures, which are at the Pushkin Museum. Myth and Legend - The City of troy featured in Homers Iliad, from which Dr. Schliemann was originally inspired, and is said to have used in his determination of the location of the lost city. Homer mentions that Troy had been destroyed by Hercules long before the Greeks under Agamemnon, and this legend may refer to the destruction of the first city. 1). The Atlas of Mysterious Places, Ed. J. Westwood. 1987. Guild Publ.